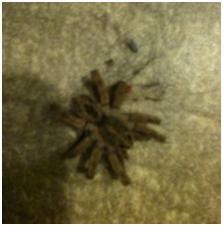 The Question: I found this spider in my house … or garage … or in my yard … is it dangerous? One of the most common questions for AskaNaturalist.com is some variation of the one above. Someone finds a spider and wants to know what it is and if it’s dangerous. And typically, there is at least one “Ewwww” or “Yuck” or “Then I killed it!” in each spider related message. I’m happy to get spider-related questions, I just wish I could convince you that they don’t need to be a source of revulsion and violence. I find spiders fascinating and beautiful. And sure, sometimes they can be a little startling. But let that first moment of revulsion and terror pass and take a close look at these tiny creatures and you might find that they are as interesting as any other wildlife. Unlike most wildlife, they tend to sit still and let us observe them. And to top it all off, most of them spend their lives keeping insect populations in check. Thanks, spiders! Are spiders dangerous: Let’s deal with the danger issue first. Most of my spider questions come from North America. There are only two types of spiders considered to be “medically significant” in the U.S. They are the widow spiders, genus Latrodectus and the recluse spiders, genus Loxosceles. If you are bitten by one of these, you should see a doctor immediately, and with medical attention, it is highly unlikely that you will suffer any lasting effect. The widows, of which the three black widow species (western Latrodectus hesperus, southern Latrodectus mactans, and northern Latrodectus variolus) are the most commonly encountered in North America, carry a neurotoxin that will cause you pain and nausea that will fade over a couple of hours. The bite of a brown recluse (Loxosceles reclusa) is also quite painful and can sometimes lead to tissue death in the area of the bite and leave a nasty scar, but usually, the bite heals with no complications. Widow spiders are found throughout the United States and into southern Canada. Similar spiders in the Latrodectus genus are found throughout the world. 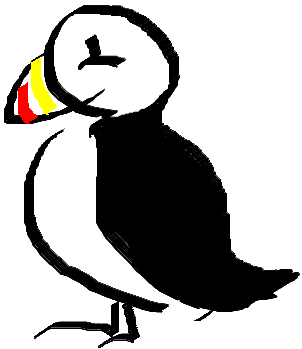 Most are small, dark, round and carry bright red markings. This map shows the range of the recluses in North America. 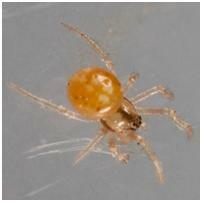 Most of the rest of the 100 or so other spiders in the Loxosceles genus are found in Central and South America. There are also a few Loxosceles species in Africa, Europe and Australia. All carry the same toxin. Neither black widow spiders nor recluse spiders are aggressive. Worldwide, there are only a few other types of spiders that are medically significant. Click here for more info. The truth is that spiders rarely bite. And you can take reasonable precautions to reduce your risk even further (for tips, see this page at Spiders.us). And on the rare occasions when spiders do bite, the bites rarely cause more pain than a bee sting. Not pleasant, but in the U.S., aside from the black widow and recluse, you have little to fear. In fact, in North America, according to U.S. Centers for Disease Control you are eight times more likely to die of a sting by a bee or wasp than by a spider bite. Now, on to the cool spiders. 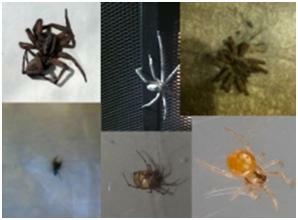 Thanks to Mandy Howe at spiders.us for her help in identifying these spiders. 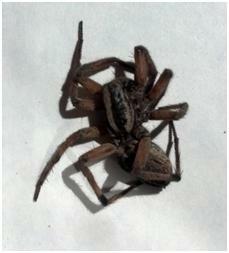 Spider 1: Submitted by Darin from Missouri, USA – This is a “wolf spider,” which means it is in the family Lycosidae. 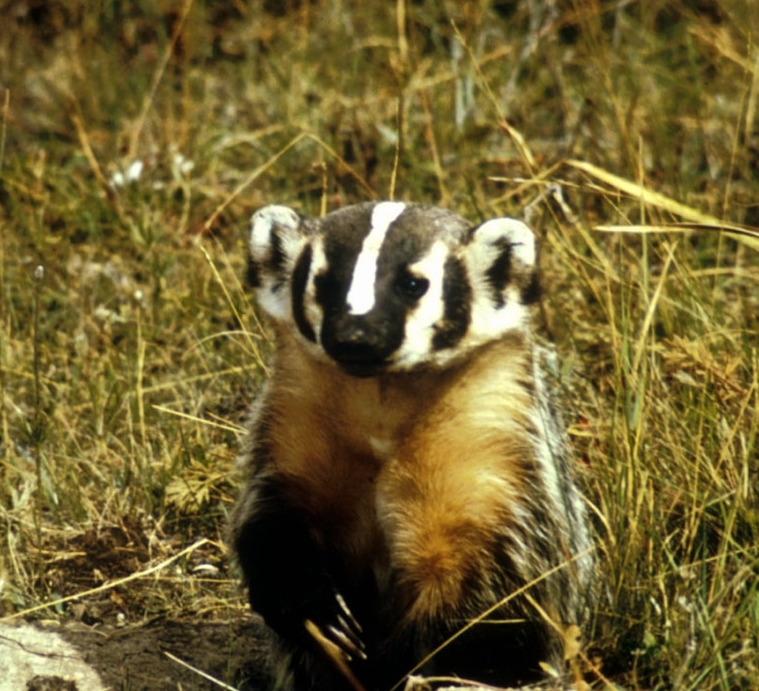 Mandy was able to identify it as being one of 19 species in the genus Hogna in North America (about 200 worldwide). Wolf spiders don’t make webs. They hunt actively and track down prey using their eight eyes. They are capable of biting and the bite has been described as like a bee sting. 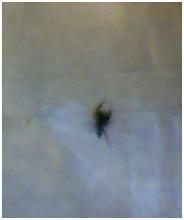 Spider 2: Submitted by Tara from Oklahoma, USA – This is a spiderling (a baby spider – isn’t it cute? ), which makes it particularly difficult to identify. Mandy is pretty sure it belongs in the family Theridiidae, commonly called “cob-web spiders.” There are approximately 250 species in North America (2,200 worldwide), including the black widow mentioned above. 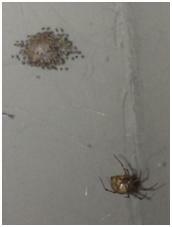 Some spiders in this family display social behavior, including division of labor, as with bees and ants. Others are “kleptoparasitic,” meaning they live in the webs of other spiders and steal prey. Bites from most Theridiidae species are not serious, but bites from any of the widow species should receive medical attention. Spider 3: Submitted by Ben from Martha’s Vineyard, Massachusetts, USA – This is another spider in the family Theridiidae. Mandy believes it may be the common house spider (Parasteatoda tepidariorum). 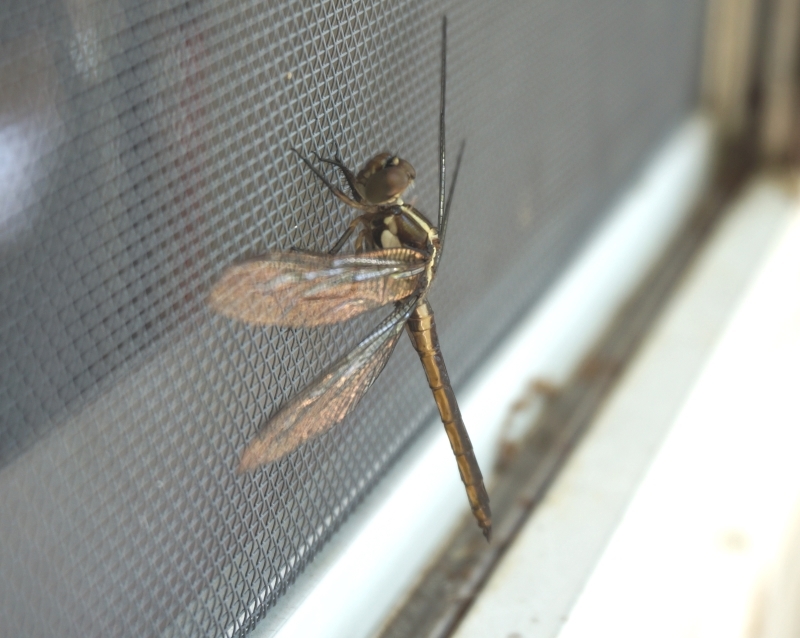 They are typically found on the outside of homes and in garages and sheds. Next to the female spider is an egg sack from which spiderlings are hatching. Each female common house spider can lay as many as 17 egg sacs in her lifetime, with each sac hatching 100-400 spiderlings. 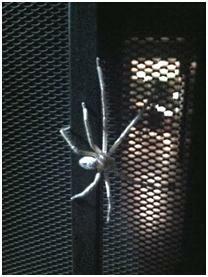 Spider 5: Submitted by Chris from Arizona, USA – This is one of the “giant crab spiders” in the genus Olios. Mandy points out that “Olios giganteus is by far the more commonly encountered species, but there are two other nearly identical ones in Arizona: O. bibranchiatus & O. naturalisticus.” Giant is a bit of a misnomer, but they can be 5 cm (2 inches) in legspan, so if not quite giant, they are fairly large. 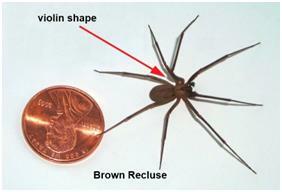 For more information about O. giganteus, Spiders.us has a page http://www.spiders.us/species/olios-giganteus/. Spider 7: And this one, Dolomedes scriptus, is my very own, from Massachusetts, USA. 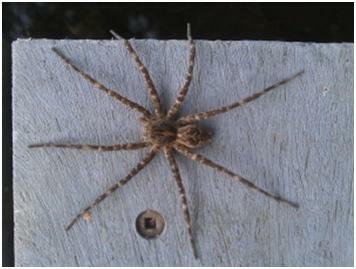 I commonly see these large spiders, which as a genus are commonly called fishing spiders, on my dock, or in my canoe or kayak. I will admit that the first time I realized that one of these spiders, roughly 8 cm (3 inch) in legspan, was a stowaway on my small Sunfish sailboat, I was a bit startled. I remember that it was big enough to make tick-tick-tick footstep sounds as it walked across the bottom of the sailboat. Since fishing spiders walk easily on water, she could have jumped ship and walked to shore any time she wanted. Instead, she stayed on her side of the boat and I stayed on mine and we had a fine ride. The patterning on these spiders is beautiful, and is an example of how, if we could get past our mostly irrational fear of spiders, we might realize that many of them are actually quite attractive creatures. So keep the spider questions coming! I love finding out more about these amazing animals. I will say, however, that because I am always compelled to learn more about them, it sometimes takes me a while to get around to posting an identification. If you’re really just looking for a quick ID, you might get faster results going to spiders.us, where they have tips on how to identify spiders yourself, as well as forums where you can post your photo so that knowledgeable people like Mandy will help you figure out what kind of spider you have. Swanson, DL, Vetter, RS. (2006). Loxoscelism. Clinics in Dermatology 24, 213–221. Langley, RL. (2005). Animal-Related Fatalities in the United States — An Update. Wilderness and Environmental Medicine, 16, 67-74. Cite this article as: Pelletier, TC. (September 22, 2012). Spiders, spiders, spiders! 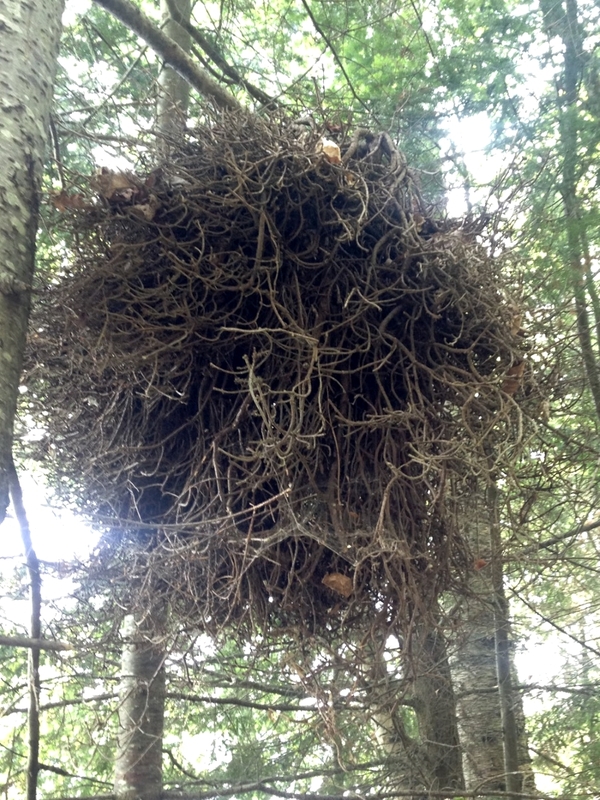 Retrieved from http://askanaturalist.com/spiders-spiders-spiders/ on April 21, 2019. Previous PostWhat is this Dr. Seuss flower?Next PostWho is this green frog and beetle? Hi, in my garage I have several spiders, very similar to the spiderling photo, except they’re about as large as an average man’s index fingernail, and they range from off white with brown spots, to bright yellow, to dark brown with yellow spots. Plus, I’m not sure if these are considered cob-webs, but they build webs similar to an orb weaver’s, but they’ll build them in every which direction. They look like small orb weavers with two spines on their abdomen, close to their head. Any idea what they might be? Hi Corey. Any chance you can take a picture?